Villa Nova is an elegant villa with contemporary style, located near the beautiful town of Lucca. Ideal for a large family celebration or get together, the house and grounds offer plenty of space and comfort to gather and relax. Comprising a main house with eight bedrooms and a converted barn with two bedrooms connected by a large courtyard, the two separate restored farm buildings offer expansive living space. Original features including chestnut beamed ceilings and unique skylights. Seven of the bedrooms in the main house have en suite bathrooms, and the eighth is an interconnecting room, ideal for children. The walled town of Lucca with its restaurants, bars and buzz is just a short drive away while rolling hills, pretty villages and the Tuscan coast are within easy reach for day trips. 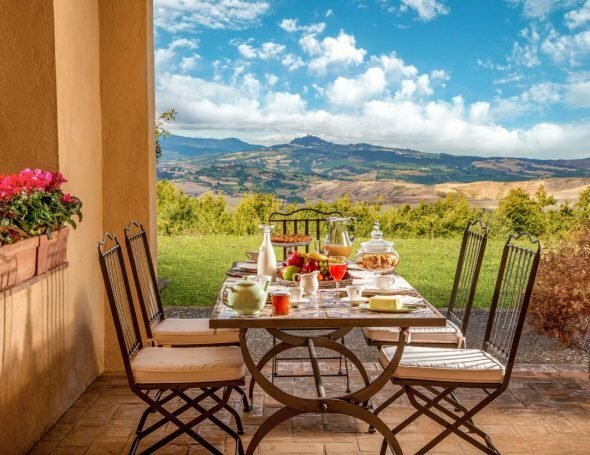 Wine tasting, guided tours and cooking lessons are just some of the enjoyable Tuscan experiences which can be arranged locally at Villa Nova. When we arrived I was amazed at the location and beauty of the surroundings. The villa is full of character and is maintained to a very high standard. I will return some time without a doubt.